Lisbon derbies are usually high-octane contests and last Saturday's match was no exception (at least for 65 minutes). There was great curiosity surrounding this match, on the back of Sporting's excellent run of results and displays, but also due to Benfica's struggles over the first few games. The fact that both teams met on the competition's third round contributed to an avid crowd, both at home and at the Alvalade. While Sporting presented a very different line-up from last season, with several new faces, Benfica's starting eleven was almost identical to 2012/13, bar the inclusion of left-back Cortez instead of Melgarejo and the conspicuous absence of Oscar Cardozo. Since Jorge Jesus remained at the helm of the team, there was expectation to confirm which was the real Benfica - the one from the past couple of weeks or the one from last season. Sporting's new leader Leonardo Jardim offered us numerous reasons of tactical interest, namely in midfield and attack. The central part of the pitch was taken up the the young and serene William Carvalho - who seems to have displaced team captain Fito Rinaudo for good - and Adrien Silva. However, Adrien would play a bit more advanced than his team-mate, with André Martins stationed to the right, a few yards up from Adrien. Things only got more interesting when Sporting attacked, since André Martins would immediately drift to the flank, exchanging positions with Wilson Eduardo - who, in turn, came inside and made diagonal runs into the edge of the bok, acting almost as a second forward. On the left, Carrillo remained closer to the touch line, forming a good partnership with the energetic Jefferson. In fact, it was by exploiting the flanks that the Lions created the most dangerous chances, often confusing Benfica's defensive duties. Jardim's men often found joy in playing simple long balls behind Benfica full-backs, namely through Jefferson toward Carrillo. 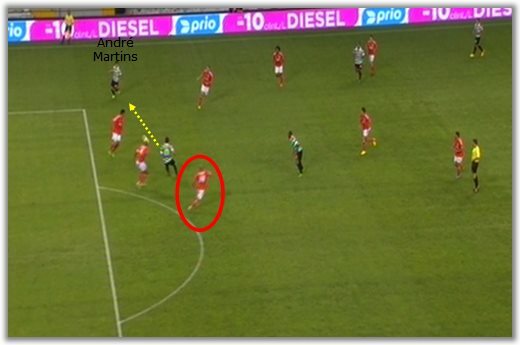 This was a typical move from Sporting, with Montero checking away from the centre-backs to collect Wilson Eduardo's pass and forward it to a team-mate (in this case, André Martins, who had drifted right, in the pocket of space behind Benfica's left-back. Despite Sporting's good move, there are simply too many mistakes from Benfica to list thoroughly. Cortez is nowhere to be found, while Matic cannot be everywhere. The centre-backs are further isolated by Maxi Pereira's baffling decision to advance (notice his feet and his body stance). Benfica's defensive organisation often seemed to be all over the place. By making the previous decision, Maxi Pereira left Luisão and Garay exposed, with the circle suggesting an alternative positioning for Benfica's right-back - in line with his manager's zonal-marking instructions throughout the last few seasons. Therefore, Montero had the time - and the intelligence - to immediately look for Luisão's blind side after passing the ball to André Martins, eventually scoring the first goal of the night. If we set aside Jesualdo Ferreira's period for a minute, there can be no comparison between this Sporting and the team led by Ricardo Sá Pinto or Franky Vercauteren. There is now greater defensive discipline, even when attacking, and the team look a lot more balanced and exposed to mistakes in possession, for instance. Defensively, André Martins would start up front in a central position, closer to Montero, leaving the right wing to Wilson Eduardo. The diminutive - but amazing - midfielder's ability to exert intense pressure under Benfica's back line often forced them to throw long balls toward Lima and Rodrigo, neither of whom excel with that particular brand of football. 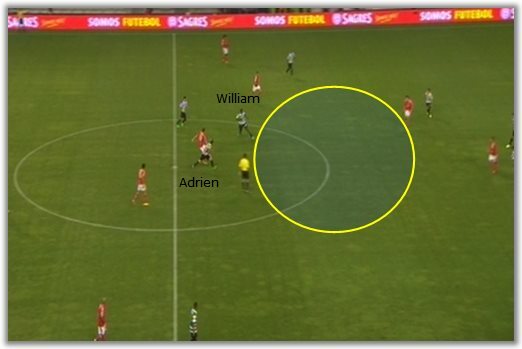 Still, this approach was not without its perils, with Benfica looking the most dangerous whenever the ball got to the space behind William Carvalho and Adrien Silva. Despite their good pressing most of the times, it is hard to understand why Benfica took so long to attack the space behind William Carvalho and Adrien Silva, particularly since the centre-backs keep struggling with the control of defensive depth. 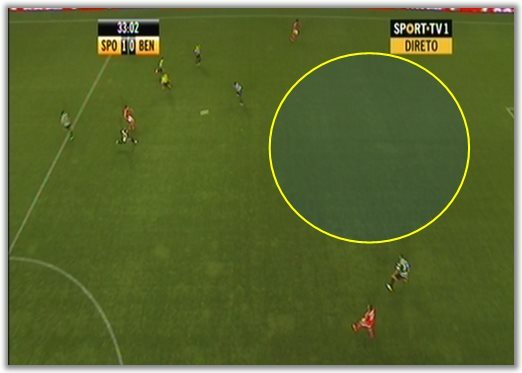 The circle represents how much space there was for Gaitán and co. to exploit. A simple pass from Matic to Rodrigo immediately bisects Sporting's lines and the chance is almost automatic. 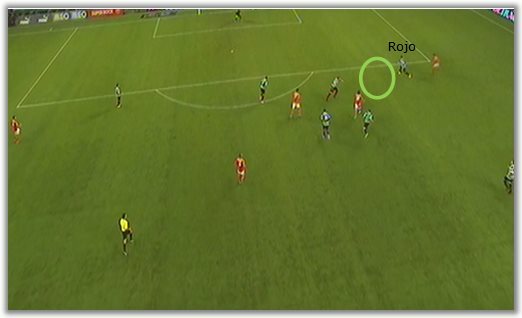 The left-back Jefferson is more worried about his man than providing proper coverage - notice the space between him and Marcos Rojo (orange lines). Rodrigo instantly plays Lima in and Benfica would have a good opportunity here. This is another example of how exposed Sporting's back-line was whenever their first pressing phase failed to win the ball back. William Carvalho and Cédric approached the play in questionable fashion, leaving acres of space for the centre-backs to cover. Despite a bland display, it's worth noting that the Eagles did not have luck on their side, with Salvio, Gaitán and Enzo Pérez all limping off. The latter was replaced with the discreet, but ever-effective Ruben Amorim, while the other two were replaced with Markovic and Cardozo. The forced changes started paying off almost instantly. With Cardozo on the team, Benfica finally had someone to hold the ball up and link up play, allowing Lima to do what he does best, i.e. run at opposing defences. Markovic, on the other hand, always looked dangerous, particularly because he insisted (and rightly so) on coming inside and take up the space behind the now less flamboyant Sporting midfield. While it's true Benfica's sparkle faded 20 minutes later, Jorge Jesus and the supporters will surely find comfort in the Maradonesque Serbian's abilities. 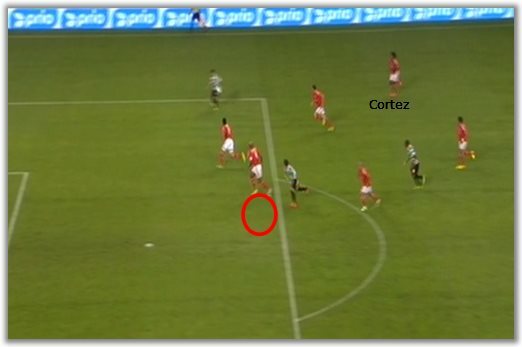 Benfica's goal was yet another example of how they could have exploited Sporting's defensive approach. Markovic collects the pass well in the centre of the Lions' midfield, with William as good as beaten - he is already late and his positioning is not the best, since he is not goalside of Markovic, as he should have been. Cardozo's simple lateral movement (red circle) is enough to leave Eric Dier undecided about what to do and open a boulevard for his onrushing team-mate. Finally, Rojo proved once again that he has serious difficulties reading the game by sticking almost irreducibly to his man, instead of providing coverage and placing himself between Markovic and his goal. 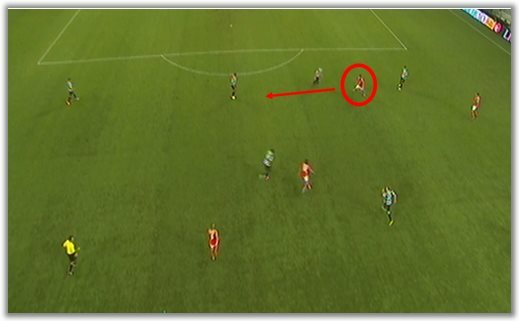 The positioning suggested by the green circle would at least offer a greater challenge to Markovic. The highlights of the evening were Fredy Montero, William Carvalho and Lazar Markovic. The striker keeps impressing supporters, coach and pundits with his great work rate and movement. The midfielder managed to accomplish more than just get by the derby unscathed, proving his coach right with calm passing and good defensive positioning. Benfica's wizard, in turn, showed once again that Jorge Jesus must find a way to play him from the start, since he seems to operate at a different pace from everyone else. Conversely, notes should be taken about Rodrigo, Cortez and Carrillo. Benfica's forward insists on failing to impress, even though part of the blame must be shared with his coach, who keeps playing the Spaniard out of position. His decision-making is hardly the best, something that is key in that specific role. The Brazilian left-back has proved to be light-years (at least for now) from what Benfica need, looking too slow and absolutely unaware of defensive responsibilities. As for Carrillo, his potential is clearly huge, but there always seems to be one too many flicks or nutmegs, often endangering his team when they need a simple(r) solution.